These are not Hollywood or politician mistakes. After all, no one caught me red-handed and forced a confession (or pointless denial). I haven’t ruined my reputation, let down my fans or lost constituency votes. In my last post I included information about why I would be absent for a day or two (an assumption that I have some huge readership that would even notice). Explaining the why details of my absence was another mistake. I initiated this website to build a community of like-minded readers and writers who would exchange support and information on the path to publishing books. What they call a writer’s platform, is a #1 must-have for anyone publishing in this new computer based world; whether traditional or self-published, you must have an established following online. I knew that I could do my part in supporting fellow writers and welcoming readers; although I am a cave girl/hermit/beach gypsy I am a great anonymous hostess. That is because I feel deeply. This is no marketing ploy, it is who I am. That said, I also maintain an e-mail bloggish kind of thing that is sent semi-regularly to my little circle of family and friends. My intention was to keep personal stuff on the F/F e-mails only. It’s tough to maintain that when a lot of my writing includes my personal life. All that to say: I intend to get back to my initial intention and keep details of my “real” F/F off this site. It’s not that they mind at all. And it’s not just the mention, but there are aspects of my family’s life that I do want to keep off this public venue. Nothing mysterious, just not for public consumption. Now, onto my other assumption mistake. 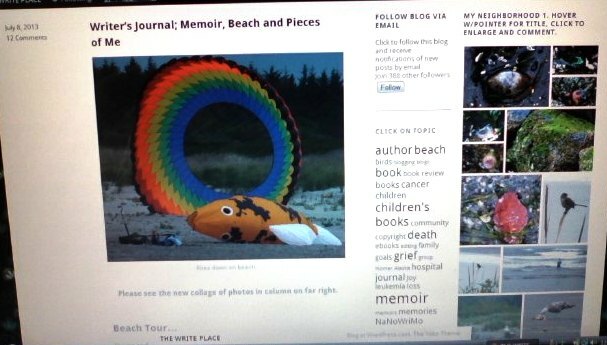 I was blown away to see what my blog site looks like on my aunt’s pc and my daughter’s smart phone. My aunt can only see 2 columns and the smart phone only shows one. You can see in the pics above, what I thought everyone was seeing (3 columns with header). Big difference, huh? So, now I get to do some homework and see if there is a wordpress “theme” (template) that will work better for everyone who views this site. I also know that browsers make a difference, so I will explore that too. I use the Google Chrome browser, so I will check out IE, foxfire, and others. I am growling over this, since I have spent the past 3+ months building my little cyber home. I got to see firsthand why some can’t comment on or like my blog posts. You do have to sign up with wordpress, but you only have to give your e-mail addy and make a password. That is good, because it gives one level of security to my site. Sorry for the hassle though. I can’t remember what you click on, but you’ll know it when you see it…scroll down to the place that says “log in” “RSS” etc and it is there. 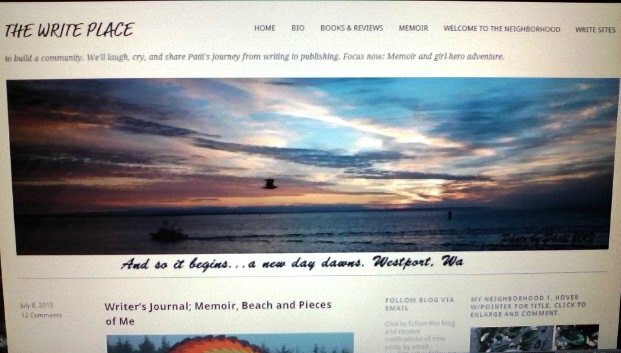 When you get to the WordPress page it looks like you have to make a blog, but you don’t. On the right is part of a sentence that is colored (hyperlinked) and says something like, “I want to sign on without building a blog page”, click that, put in your e-addy and a password and you’re in! I went through this process with my aunt, but forgot to take notes. If you have wordpress website or browser advice I would love to hear/read it. Please add comments, questions or “like” if you are able to. Categories: BLOG TALK, Writing Journal | Tags: business, comments, family, Friends, likes, mistakes, wordpress, writer | Permalink. I leave it for the beach, and I have visited my mermaid deli friends 2 times in the last few weeks. I also visit Carol & Greg next door. That’s enough for now, although seeing my grands, Sara & Jon in Centralia was much needed and short, but sweet visit. I don’t have one so I don’t know, but I have heard that photographic headers don’t always work well as seen from other people’s computers. I have sort of kept mine simple, but I love the creativity expressed in other blogs. I love your header and would hate to see it go from the wordpress community, but it might have to from the perspective of an outside audience. It is how I easily recognize you. I suppose a lot depends on the purpose of your blog. Mine is social to connect with other readers and writers. Some use it purely as a promotional and others are very specifically trying to sell themselves or something else. Thank you for taking the time to give me some input. I’m going to give it some thought and research and make any changes later. I also understand and respect the need to ‘dole’ out private matters…in as much a controlled, and measured way as possible! I also understand what ‘needful-things’ F/F can be, and the email-blog lacks the more open interaction…that at least subconsciously, F/F seem to act on as an inalienable-right to know, and opine of your life. Thanks, malikoma. I appreciate the insight. I see no mistakes,only growing pains.you are doing wonderfully!!! I agree with one of your many commentors that you aren’t doing ANYTHING wrong! I’ve been doing my blog thing for a couple of years now, and I’m always amazed when I push the “publish” button that it looks something like I had intended it to look. Any more, I’m happy with approximations. You’re doing great! (If I seem a little distracted it’s because I’m a little upset at spellcheck for telling me I’m misspelling “commentors”. It’s trying to get me to change it to commentators which is an entirely different animal! But what can you expect from a service that is telling me I’m even misspelling spellcheck!) Just keep on doin’ what you’re doin’! The difference of the looks annoyed me when I first discovered it, but it became too much for me to worry about! I know, I should just leave it. For now though, I did learn my directions for finding things won’t work for everyone. Thanks for commenting and visiting again Luanne. For a very long time, I presented only my professional self to the world. But I increasingly felt a need to be more authentic – more of who I truly am – across all platforms: my business, my friends and associates, my writing. I would never go back to that buttoned up and censored self. You just need to find a balance! With regard to your blog appearance, according to WordPress, the template you’ve used comes with a responsive design feature, meaning it should reformat itself to look good on all browsers/devices. But you might need to select that feature in the Appearances menus. But in some cases, most especially with IE, what you want folks to see and what they do see are two different animals that you just can’t control. Thank you, Jen. I appreciate the tips and the time you took. Don’t give up, you have somewhere to turn. ‘Til every wave is warm and bright. Soon you’ll see a golden stream of light. Don’t let the stormy darkness pull you down. © 1976 Walt Disney Music Co. and Wonderland Music Co., Inc. Thanks, malikoma. The lyric made me sad and then I got sidetracked and forgot to thank you. For now, i’m leaving everything as is, it just really surprised me. A more intuitive security would be nicer – something that could read the spam, understand it, and reject it. Seriously, how many people really are to having been seen exactly what point I am made for they have been searching hours and days on interweb to find exactly this information such as they have been meaning to find? Exactly, can’t be more than fifteen or twenty! You to, come by again. Like many others have already noted, this is all growing pains, some worth noting and some not. Mobile devices have made things a bit more difficult because of differences in software. My advice would be for people to read your blog on a computer, not a phone, if they really want to enjoy the full experience 😉 As for personal info, it is a difficult line to walk. I originally thought my blog would be 100% professional, later I thought it would be just about my writing (nothing about me personally). Finally, I said “to hell with it.” I’m having too much fun being and sharing myself 🙂 But I do have limits. I am married but I keep mentions of my husband to a minimum out of respect for his privacy. Same for family members and friends. I may mention them obliquely, but not gratuitously. See you at camp (or maybe not because of the different time zones … )! Thanks for the comments, Marie. It is a lot to learn, but I’m happy to be doing this whole blog thing. Glad you are too! Yes, just a happy coincidence.